How would you like to DJ and join our fantastic team of DJ's? WELL! You're in luck! 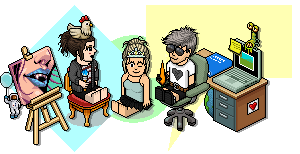 Here at HabboxLive we're looking for new and excited radio DJs to complete at least 3 slots a week whilst putting on the best most enjoyable shows possible! A lot of people think that experience is key when applying however, that isn't the case at all! In the past year we have taken on new DJs with no experience whatsoever and in time with experience and our help and guidance they're now some of the best DJs here at HabboxLive. A lot of the DJs we have hired have gone up the ranks and have become Senior or Head Djs, that just goes to show how successful HabboxLive really is! Would you like to run your own team? A lot of new DJs have gone on to do just that! And guess what? That could be YOU! 1) A lotto system based on the number of slots completed. The more you DJ, the more chances you have to win X amount of credits each week. 2) Any DJ who completes 10+ slots each week goes in for a chance of winning a jingle tailored to them. Experience: Yes/No. If yes? Where? From all of us here at HabboxLive we hope to hear from you soon! We are proactively looking for DJ's in any timezone. If you like the sound of the above and are interested in applying then please message me the above details!